Matt Duncan is an impoverished writer who’s just been let go from the Los Angeles WPA writers’ project (it would take an entire article to explain this idea to the millennial reader; Wikipedia has one here). He runs into a wealthy school friend and rapidly finds himself working as an assistant to Wolfe Harrigan, a professional debunker of phoney religious cults; meanwhile Wolfe Harrigan’s beautiful niece Concha is attracting quite a bit of Matt’s attention, even though she’s engaged to his wealthy school friend. Currently, Wolfe Harrigan is investigating a religious figure calling himself Ahasver, the Man In Yellow, whose “Temple of Light” is developing a huge following. Sure, it looks like another loony-tunes cult, but Ahasver is raking in a lot of money and developing a lot of fanatical converts. The Temple of Light has a cursing ritual that it enacts in order to bring disaster to its enemies, called the “Nine Times Nine”. When Wolfe Harrigan is the latest recipient of the curse, he laughs; but the next day, Matt Duncan looks up from the croquet lawn to see a man in a yellow robe in the study with Wolfe Harrigan. Harrigan’s sister is sitting outside the study, and she didn’t see anyone leave … all the doors and windows are locked from the inside. But Wolfe Harrigan’s murdered body lies on the floor and no one knows what happened. Lieutenant Marshall of the LAPD investigates, with the help of his wife, who’s a retired burlesque dancer (coincidentally, she’s reading the locked-room chapter from John Dickson Carr’s The Three Coffins at the time), and learns that, at the exact time of the murder, Ahasver was lecturing to a group of his followers miles away. It takes the talents of Sister Ursula, amateur detective and member of the Sisters of Martha of Bethany, to figure out the answer to this difficult locked-room mystery. Anything by Anthony Boucher is worth your time, to be honest. Boucher — yes, the guy after whom they named the BoucherCon mystery convention — was a prominent critic (for the San Francisco Chronicle) and mystery writer, expert on Sherlock Holmes, creator of mystery-oriented radio programmes, and also an expert on science-fiction. And in general he was a polymath; one of those people who knows everything about a few things and a lot about everything in general. 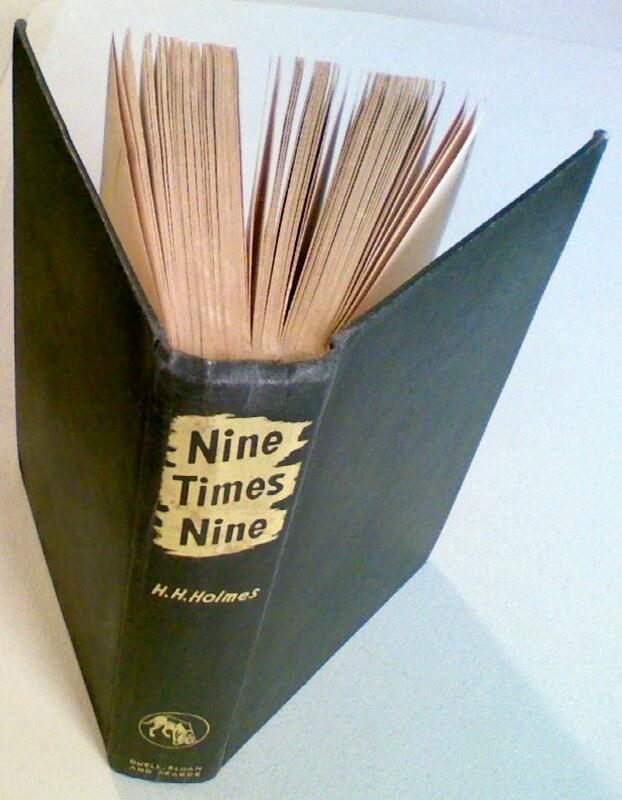 He only published seven mystery novels, but each one of them is intelligent, inventive, and brain-crackingly difficult. Boucher only wrote two Sister Ursula novels, of which this was the first; the other, Rocket to the Morgue, is a fascinating roman a clef set against the background of the actual science-fiction writers group of which Boucher formed a part. 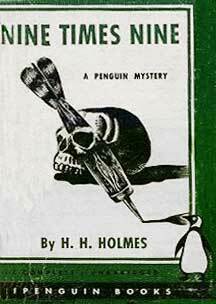 Both were first published as by H. H. Holmes (who was an actual turn-of-the-century murderer in Chicago), but Boucher’s other five mysteries came out under his own name. I won’t say much about the mystery itself here, for fear of spoiling your enjoyment. Trust me, it is a genuine locked-room mystery, and you can imagine that if Boucher had the nerve to suggest to the reader that the locked-room chapter from The Three Coffins would be worthwhile reading, you can bet that he came up with a solution that will make you slap your forehead at the end of the book. If you follow the plot very closely and don’t allow yourself to be fooled by preconceptions, you will possibly be close to the solution at the end; it’s a satisfying and smart answer to a difficult puzzle. But there are other reasons why this book is worth your time. For one thing, Boucher gives us a wonderful glimpse of West Coast U.S. society just at the U.S.’s entry into the Second World War; these pseudo-religious cults used to be a regular thing in Southern California, and Boucher has produced a delightful insider’s view. The characterizations are charming and, while some of them might be difficult to believe (it’s not likely that burlesque artists marry policemen and settle down, and this is just as unlikely as a mystery-solving nun) they hang together and definitely interest the reader. In fact this novel has a lot about people and how they react to stressful situations. I think it’s safe to say that the mystery is the strongest point of interest in the book, but the background interactions are fun too. Still not especially politically correct or even enlightened, but further down the path than one might have expected. I know you’ll enjoy this novel, if you just relax and let it roll along. If you are like me and always want to try to solve the mystery, you’ll find this one quite difficult but not absolutely impossible. And you will also enjoy the milieu of 1940s California, and Boucher’s insightful eye for social change and ear for dialogue. 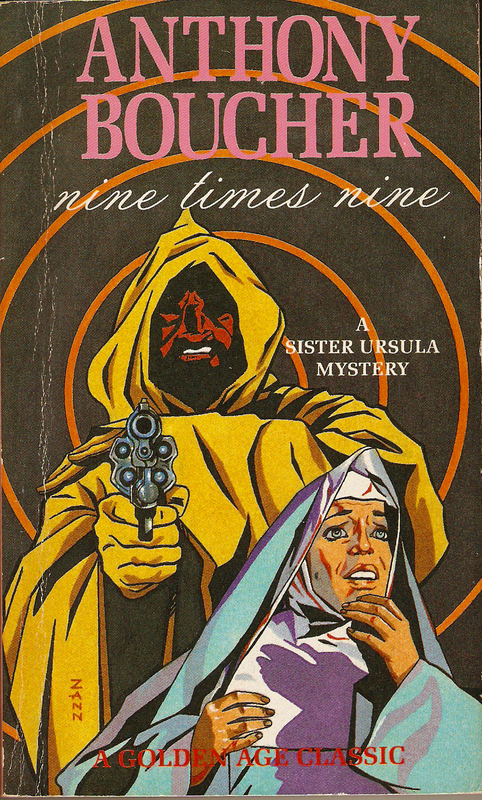 There’s also a romantic subplot, some interesting observations on religious belief, and Sister Ursula, who to me should have been the hero of a few more Boucher novels. I think my favourite edition would be U.S. Penguin #553, pictured here. 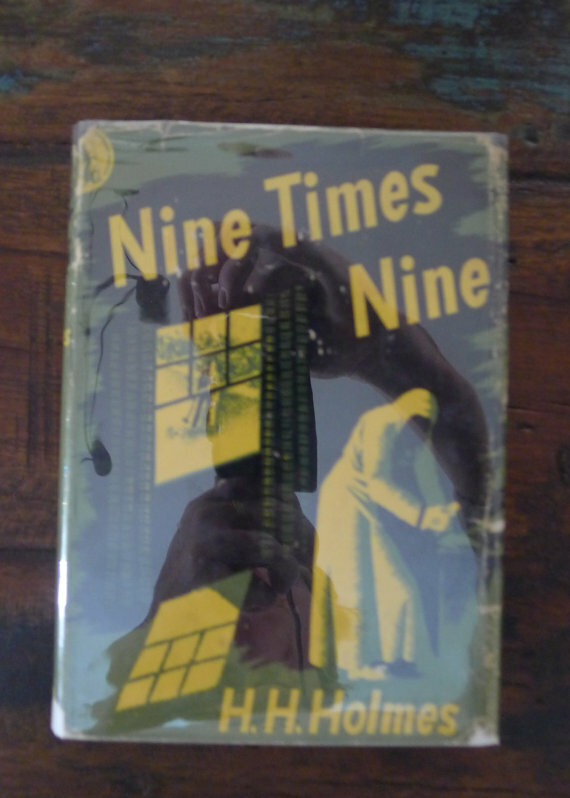 #553 is not, as you might, think, their 553rd book; their numbering system is quite bizarre but this would be one of their first 50 publications, in 1945. I like the deep green that is shared by this line of books; the illustration is cheerfully bad and I like the idea that this is the only such paperback as by H. H. Holmes.